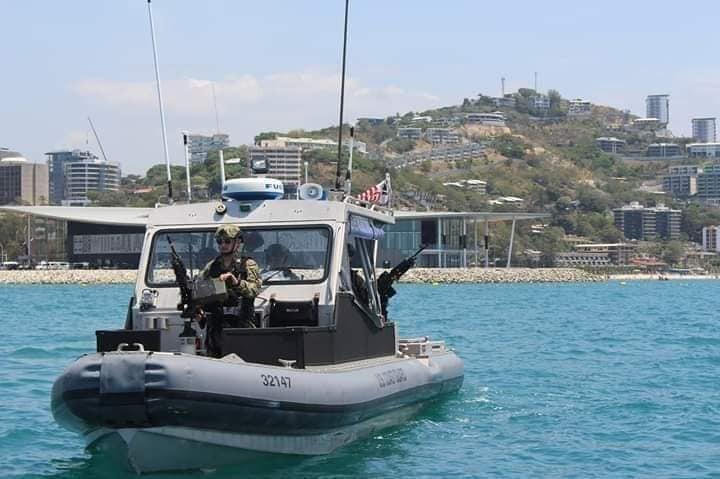 The US Coast Guard is assisting the Joint Security Task Force provide in-shallow water maritime security just around the APEC haus and the three cruise ships in Port Moresby, Papua New Guinea. Up to ninety five (95)United States Coast Guard personnel based out of Port Security 305, Virginia Coast have been in Port Moresby for over a week providing maritime security service, during the APEC 2018 Leaders Week and Summit. The US Coast Guard unit PSU 3.0.5 Commanding Officer Michael McCarthy said they will be partnering with Australia, New Zealand and the PNG Water Police to monitor the restricted areas. Commander McCarthy revealed that about 100 personnel will be providing the security equipped with 8 transportable port security boats. He said the transportable port security boats are just under 10 meters long and they will be working in between the maritime restricted areas which have been established by the PNG Joint Security Task Force. Meanwhile, he said so far interaction with locals around the coasts outside of Port Moresby City areas have been positive.